Egg white protein powder has been a favorite of health enthusiasts for years. Even before whey and casein protein powder hit their popularity in the 90s, egg white protein powder was a key component in nutrition among bodybuilders and other people trying to maintain the best possible health. Just like anything, though, egg white protein powder has both benefits and risks. Let’s take a look at this vital source of protein and help you make sure you maximize its health value. What Is the Egg White Made Of? The egg white, or the albumen, is a source of both protection for the yolk as well as nutrition for soon-to-be chick. It’s approximately 90 percent water with ten percent proteins, including albumins, mucoproteins, and globulins. It contains almost no fat or carbohydrate content. Egg whites might not be the largest component of the food, but they pack a punch. In fact, egg whites can contain as many as 40 different proteins, including ovalbumin and ovotransferrin. Ovalbumin makes up roughly 55 percent of the protein, and ovotransferrin comprises more than ten percent. The benefit of ovotransferrin is that it is an iron-binding protein that provides antimicrobial properties. In addition to the proteins, egg white also contains a host of various amino acids. These include leucine, isoleucine, and valine, which are critical for driving muscle protein synthesis, which leads to muscle growth. The protein in egg white stimulates muscle growth and, in studies, has been demonstrated to increase muscle protein synthesis. It is this muscle protein synthesis that helps your muscles grow and strengthen. Leucine, the major amino acid responsible for stimulating muscle protein synthesis after a meal, is highly concentrated within egg whites. In fact, egg white contains approximately nine percent leucine, a concentration ten to 20 percent higher than most other protein sources. Another amino acid available in plentiful amounts in egg white protein, arginine stimulates the body’s production of nitric oxide, which dilates blood vessels. This helps in increasing blood flow to your muscles, delivering more oxygen, nutrients, and anabolic hormones. The end result is better energy during workouts and improved muscle recovery and growth afterward. Egg protein is digested quickly and at a moderate rate, leading to a large increase in plasma amino acids. Muscle cells are quite sensitive to changes in your blood’s amino acid levels, and this rapid increase spurs on a large muscle-building response. This nutritional supplement is typically made from dehydrated egg whites processed into a fine powder. Manufacturers then use spray-drying process to produce the protein powder, followed up by pasteurization. Pasteurization also deactivates salmonella. While egg white protein powder is available unflavored, most manufacturers also produce the supplement in vanilla, chocolate, and strawberry flavors. 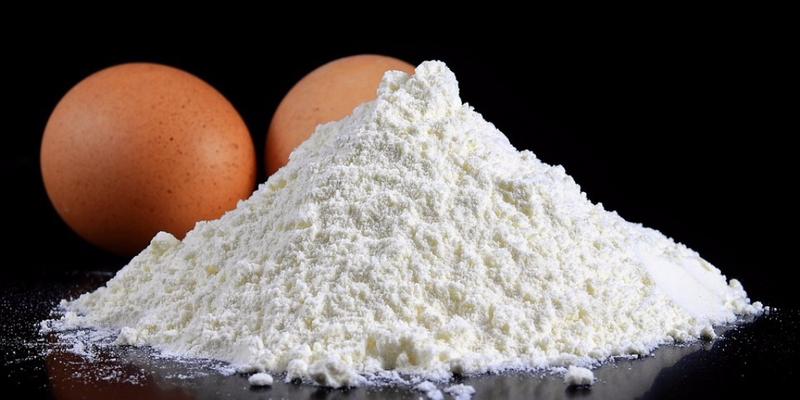 Egg white protein powder is typically manufactured through spray drying, and the eggs are not cooked. It is pasteurized, which kills salmonella present but there’s no evidence of pasteurization effect on the presence of avidin. Avidin might bind with biotin (B7) and cause deficiencies. Egg white protein powder doesn’t mix well with water. It tends to clump up and generate foam that can cause gastrointestinal problems. Egg white protein might cause serious bloating because of the foam it builds. However, I have noticed it mixes quite well and eliminates foam completely when you add some milk or anything more viscous than water, like milk. Even 50ml milk would suffice. If you want to skip the milk, you can even add some whey/casein for improved mixability and better amino acid profile. You can also mix egg white protein powder with other protein supplements, to creates the perfect blend of muscle growth encouragement. Whey protein powder is digested very quickly, while egg white protein powder is absorbed by the body a bit more slowly. Casein protein powders take the longest to digest. A growing body of research seems to confirm that combining fast-digesting whey protein with slower-digesting egg white and casein is better for muscle growth. Whey protein is digested and absorbed the fastest and leads to a definitive spike in muscle protein synthesis. Unfortunately, it’s quickly used up and the protein synthesis drops sharply. Researchers first found that mixing whey with casein resulted in better muscle growth, presumably because the slower-digesting casein protein would encourage muscle synthesis long after the whey protein was used up. This same logic suggests that adding egg white protein should be even better for muscle synthesis – the whey will spike muscle growth, and the egg white protein will encourage it to continue after the whey has been fully digested. The end result is greater muscle growth since the synthesis of your muscles continues for many hours instead of just a short-lived burst of time. Egg whites contain plenty of other beneficial components, such as sulfur. Sulfur, while it smells horrible, is critical to your body’s hormone-producing pathways, helping further enhance muscle growth. Egg whites are one of the highest-quality proteins you can find, and the amino acid makeup of the supplement spurs the body into muscle-growing glee. In fact, egg whites are often referred to as the perfect protein. 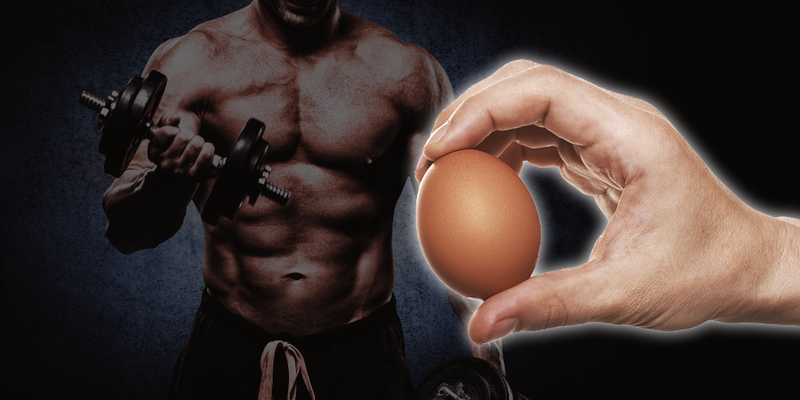 Question:  Should I replace eggs in the diet with egg white protein powder? Question: Should I replace whey protein with egg white protein powder? I won’t recommend anyone to replace eating eggs with egg white protein powder. Why replace anything in your diet. Use it to further increase your egg (egg protein) intake. Use whey and egg white protein in conjunction, for a wider amino acid profile. Adding Egg protein powder (medium) to Whey (fast digesting) or Casein (slow digesting) allows you to get the benefits of a complete amino acid profile and different digesting rates.